Beautiful pink blossoms and near white foliage with hints of mint green structured like pagodas in whorls along the stems. Large orchid like flowers are yellow with brown speckles and spots and bloom at each upper bract. 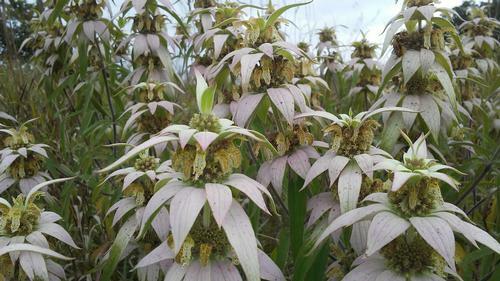 This Monarda is heavy with nectar for all the native pollinators and is especially beneficial for the Karner Blue butterfly.